The Bank of New South Wales was established in New South Wales in 1817 and opened its first branch in Perth in 1883. During the Eastern States Depression of the 1890s, the Bank looked to Western Australia as an area of growth due to the gold rush, opening four branches in the Goldfields during this period. 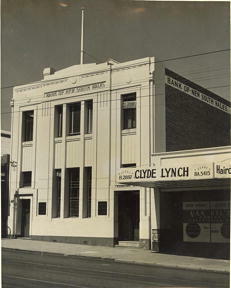 On 29 March 1927, it merged with the Western Australian Bank, giving it over 30% of bank business in the State. The bank building at 452 Fitzgerald Street was built in 1938 and indicated a return to economic optimism, following the end of the Great Depression. The two storey Art Deco building was designed by prominent Perth architects Hobbs, Forbes and Partners who designed the Criterion Hotel in Hay Street and the iconic Swan Brewery building on Mounts Bay Road, Crawley. The firm also designed numerous bank premises throughout the State. It was built by Sandwell and Wood for the sum of £5,111 and is an example of interwar stripped classical style architecture. 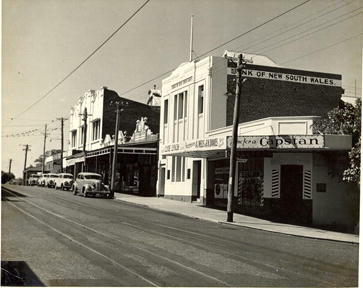 Fitzgerald Street was a key commercial centre for North Perth. Other businesses located along this section of the street in the early 1940s included A J Wells and R K Davies hairdressers and fancy goods (no. 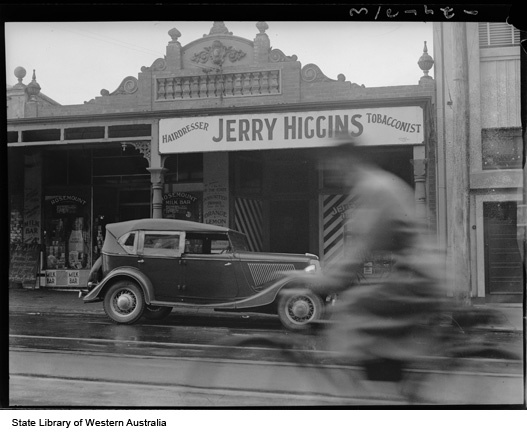 450), Clyde Lynch hairdresser and tobacconist (no. 450a), a mixed business store, Crown Dental Company, Shonis and Kalfounis fruiterers (no. 460), referral rooms, Rosemount Theatre (no. 464), a newsagent and Massey and Sons fuel merchants (no. 468). “On the corner of Fitzgerald Street and Wasley Street there was the place I used to get my hair cut. It was run by a youngish man called Clive Lynch and really the mainstay of his business was illegal betting in the back room. In fact, there were two of them in business because just up from Clive Lynch there was Gerry Higgins. He had a big notice on his window saying ‘I communicate with Hobart’, which meant that you could buy Tattersall’s tickets, which you weren’t supposed to. In between them of all the things of respectability, they built the Bank of New South Wales. There was the bank with these betting shops on either side. In October 1982, The Bank of New South Wales changed its name to Westpac Banking Corporation. The bank expanded rapidly in the 1980s. However, as a result of the economic downturn at the end of the decade, Westpac declared a loss of $1.6 billion for the financial year ended 30 September 1992. The closure of the branch in the 1990s was one of a number across the country and can be attributed largely to changing technology and downsizing to maximise profits. Since its closure, the former Westpac Bank was converted to a residence and commercial photography studio. The building appears to be the only pre-1940 bank building remaining in the City of Vincent. 101968PD W.G. 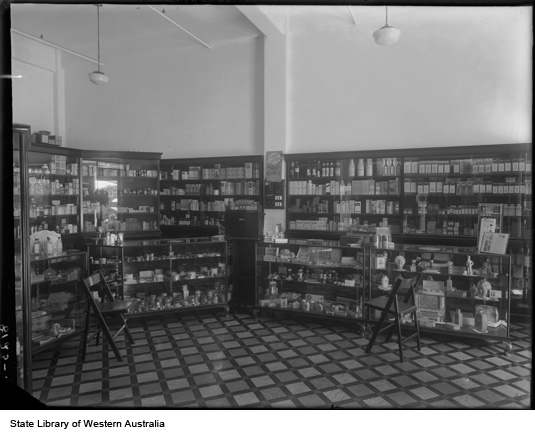 Wynne’s Pharmacy, 423 Fitzgerald Street North Perth, 1934. Sourced from the collections of the State Library of Western Australia and reproduced with the permission of the Library Board of Western Australia. These images have been preserved and made available by the Historical Records Rescue Consortium (HRRC) Project supported by Lotterywest.